Over the auto industry’s long history, both domestic and foreign manufacturers have proven that they can rapidly churn out innovative products for the U.S. market to meet evolving consumer expectations. However, relatively low product differentiation paired with intense market competition has forced those within the automotive industry to consider ways to attract consumers while still maintaining healthy profit margins. One way in which automotive companies have boosted sales is through increased debt financing with questionable credit underwriting. While this may boost revenue, what does this practice mean for the bottom line? After bottoming out at 10.6 million units in 2009 during the last recession, U.S. total vehicle sales have surged, peaking at 17.9 million units in 2016. However, the sales pace has slowed in 2018, with August sales slipping to an annual rate of 17.0 million. As auto sales continue to slide, auto companies are finding more attractive ways for consumers to finance their auto purchases. We see that trend in the Federal Bank of New York’s quarterly report on household debt and credit. Even as vehicle sales have flattened, the amount of consumer auto debt has continue to soar, reaching an all-time high of $1.24 trillion in June 2018. Motor vehicle manufacturers have become increasingly willing to increase the receivables on their balance sheets and deliver product to consumers with the expectation of future payment. In theory, this is advantageous for both parties. However, the data indicates that the underwriting process has deteriorated and consumers are struggling to meet their debt obligations. 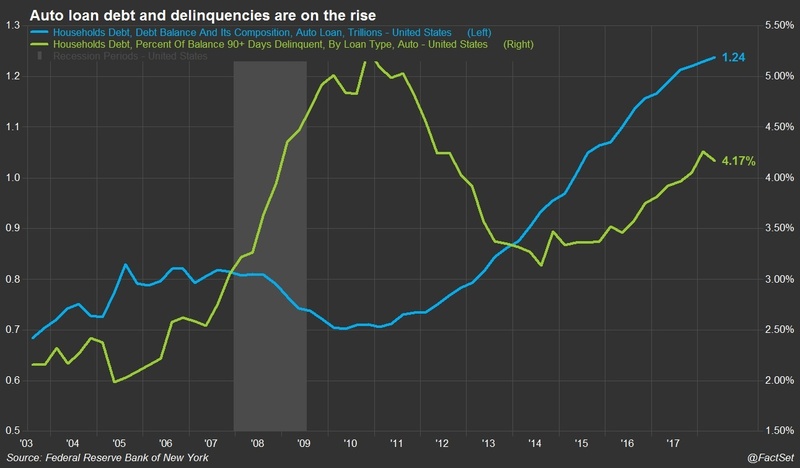 Over the last four years, the percent of auto debt obligations that are 90+ days delinquent has risen from 3.3% to 4.2%. That means there is about $51.7 billion of delinquent debt within the automotive industry. The NY Fed’s Q2 2018 report says, “For auto loan originators, the median [credit] score declined by 5 points, as individuals with subprime scores maintained a substantial share of newly originated auto loans.” Whether it is dishonest income verification, an increase in the volume of borrowers rolling negative equity from an old loan to a new loan, or deteriorating FICO score profiles on the underlying loans, companies have strayed away from proper credit underwriting practices. If underwriting practices suffer to meet volume demands, investors will suffer the consequences. There are varying degrees to which companies have felt the burden of rising consumer delinquency from a capitalization, performance, exposure, and risk standpoint. The degree of their pain is dependent on two things: revenue exposure and country of domicile. 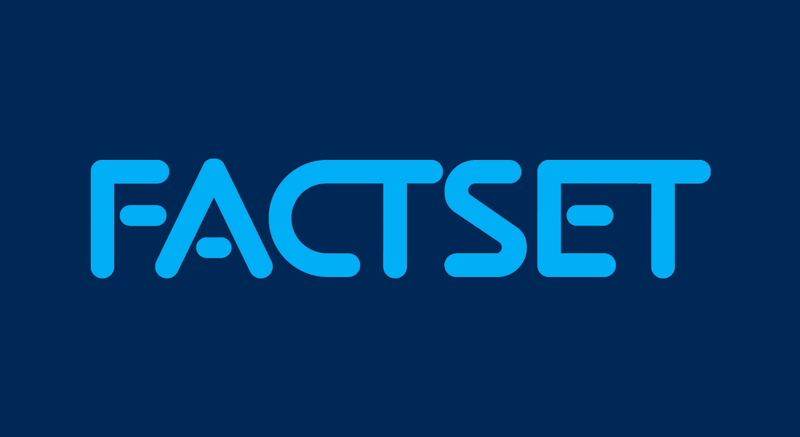 For the 95 companies classified in FactSet’s World/Motor Vehicle industry group, 23.3% of their revenue can be attributed to U.S. consumers. 27 of those companies have at least 10% revenue exposure to the U.S.; 12 of these 27 companies have seen their bad debt expense increase over the last five years. U.S. auto companies are feeling significant pressure on their receivables as a result of the delinquent debt. General Motors (GM), which recorded 76% of its sales in the U.S. in the 2017 fiscal year, saw a 31% increase in bad debt expense from a year earlier. At the same time, Ford Motor Company, which generates 60% of its sales in the U.S., saw its bad debt expense increase 15% year-over-year. For GM, the inability to collect on outstanding debt has created a liquid asset issue, characterized by a negative free cash flow margin. A shortage of cash could in turn lead to diminishing productive capacity down the road. The correlation between U.S. revenue exposure and debt collection issues isn’t consistent across all companies, however. 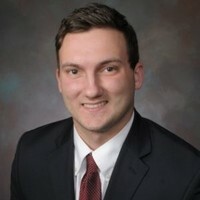 Both Subaru and Fiat Chrysler generate significant portions of their sales in the U.S. Sixty-three percent of Subaru’s revenue comes from the U.S. while Fiat Chrysler earns 52% of its revenue in the U.S. Over the last five years, these two companies have actually seen decreases in their bad debt; over this time period, Subaru’s bad debt has fallen by 36% while Fiat Chrysler’s dipped by 68%. The caveat here, and something that Ford and General Motors can learn from, is these companies sell very little inventory on account; both companies report receivable-to-sales ratios under 5%. 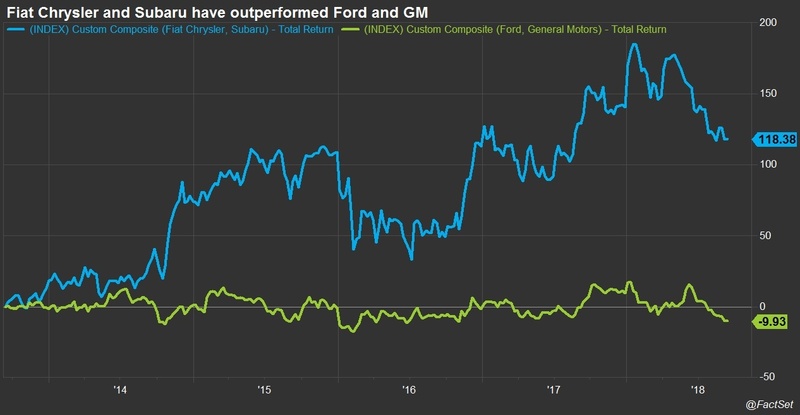 Subaru and Fiat combined have drastically outperformed Ford and General Motors over the last five years. To suggest that the amount of bad debt on your books is directly telling of price performance would be a stretch. But, it does suggest that perhaps investors are becoming wary of the levels of debt within the U.S. auto market. Overall consumer debt has surged in recent years. As a result, analyzing the asset liquidity of companies who loan directly to consumers is more important than ever. Although auto loans represent less than 10% of total consumer debt, the housing crash that occurred a decade ago serves as a lesson on the risks posed by subprime debt. Auto companies need to pay attention to their consumers' ability to service future debt obligations. When underwriting practices suffer, this puts the overall performance of a company at risk. Sara Potter, CFA, Associate Director, Thought Leadership and Insights also contributed to this story.